A pocket sprung mattress is quite simply the very best mattress available. 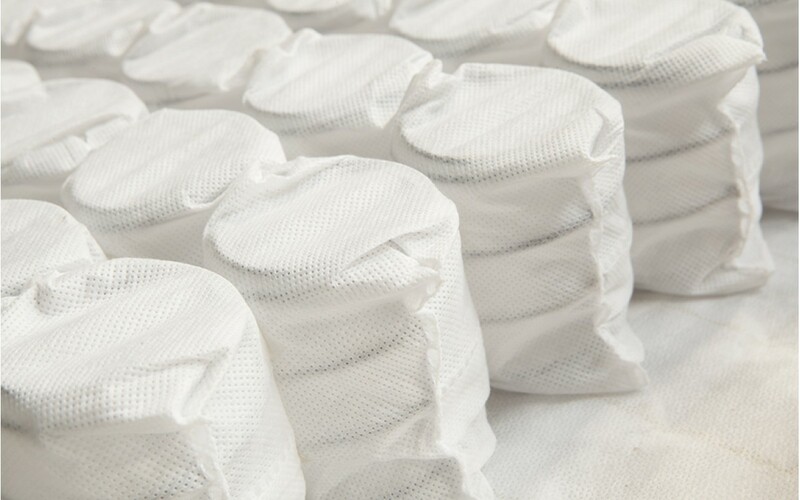 In these mattresses, the springs are sewn into individual fabric pockets with the fabric surrounding the springs functioning like a shock absorber, increasing the firmness of the mattress and reducing bounce which in turn increases comfort. They provide better support for your body, as each coil absorbs the weight individually to allow the contours of the body to be gently and uniformly supported. Pocket sprung mattresses are especially good if you sleep on your side, which puts different pressures on your spine. Pocket springs are rows of small diameter, 16 to 17 gauge wire, parallel or barrel-shaped springs, each housed separately in a fabric pocket. The rows of springs are then clipped, tied or glued together. The spring count of a pocket sprung mattress can vary considerably depending on the diameter of the springs. How many springs are there? A standard coil sprung mattress will typically contain 325 springs and a pocket sprung mattress can have any amount between 500 up to 3000 springs, though in reality you don't need greater than 2000 unless you're after a very, very firm mattress. From experience here at Linx Beds we prefer to keep the count between 1000 (soft) to 1200 (firm) springs, providing a great balance of price and comfort. Pocket sprung mattresses were created to combat the problems one might experience with a bad back or painful joints by providing a firm mattress which offers targeted, tailored support. The appropriate support, and a reduction in pressure point pain can help sufferers to get a good night’s sleep and much needed pain relief. By investing in a good mattress that will provide excellent support, such as a pocket sprung mattress, you will be able to maintain a good posture whilst you sleep and experience a reduction in any suffering you might ordinarily encounter during the night. How are they different to other mattresses? The pocket sprung mattress is ideal if there is a weight and/or size variation between you and your sleeping partner. The individual springs in each side will act to take the weight of just your partner so you won't be lifted or rolled over due to the impact of your partner's movements. In a traditional open coil system the springs are interwoven, so when pressure is applied to the springs at one end it can have an effect on the springs at the other end causing the 'roll together' and a feeling of being bounced about when your partner sits or moves on the bed. These problems are eroded by a pocket sprung mattress and if you move around a lot in your sleep, your partner is less likely to feel it.